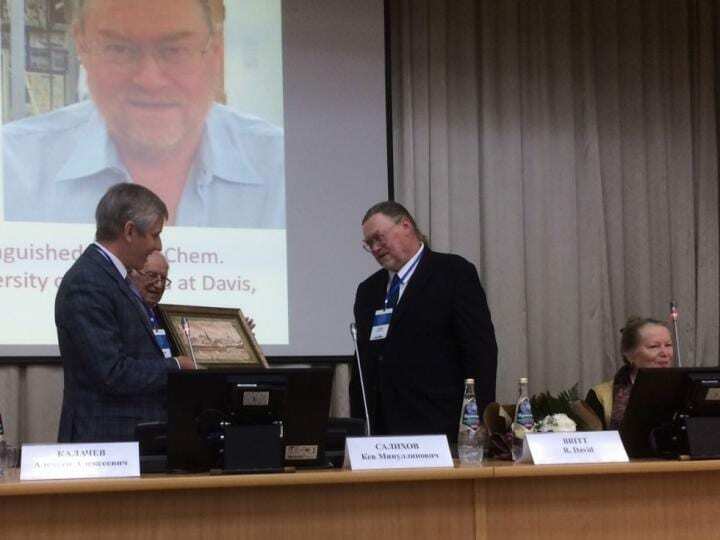 R. David Britt (University of California, Davis) was awarded for his innovative contribution to studies of enzymes with electron paramagnetic resonance. In his PhD candidate years, Dr. Britt assembled one of the first impulse EPR-spectrometers to research manganese spectrum in active photosynthesis sites. He has received several awards for his work and is on the editorial board of Photosynthesis Research. The Zavoisky Award was established in 1991 and has been co-sponsored by the Government of Tatarstan since 2010. Kazan Federal University is one of the co-organizers of the selection process. Vice-Rector Dmitry Tayursky congratulated the winner on behalf of Kazan University. He noted that KFU continues the traditions of scientific curiosity laid by the discoverer of electron paramagnetic resonance Yevgeny Zavoisky. Dr. Tayursky wished Dr. Britt many years of further success in research. The Zavoisky Award is annual prize of 5,000 euros given for outstanding application of electron paramagnetic resonance in any field. A diploma and a medal are awarded with the cash prize. Traditionally, winners deliver lectures immediately after the ceremony. This time, Dr. Britt spoke about solar energy.